Why is it so hard to get work done? In this eBook, we take a look at the issues facing R&D organizations every day and explore what actions they can take to make sure their collaborative projects run as smoothly as possible. In this eBook, we take a look at the issues facing R&D organizations every day and explore what actions they can take to make sure their collaborative projects run as smoothly as possible. In an increasingly global world, it’s common for teams from different departments, buildings, countries and even different time zones to work together on a daily basis. Even the most basic projects are fraught with all kinds of logistical problems – with various parties needing to coordinate activities and transfer data and reports. 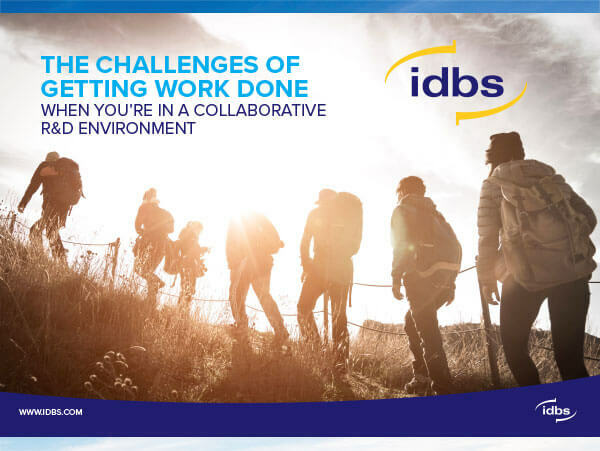 Combined with the rise of internal and external collaborative work, with other departments, contract research organizations (CROs), joint ventures, academic partnerships and consortiums, it’s easy to see how a mix of disparate data files and formats could make it harder than ever before to complete work quickly and efficiently. If you are challenged by the changing scientific work landscape, you’re not alone. According to CEB data, the top priority for R&D leaders is to beat competitors to market with big innovations, but conversely 90% of these organizations believe their pipelines are simply too slow to turn any ideas into successful products. Successfully leveraging partnerships is the way to get ahead, by increasing capacity and innovation within R&D. In this competitive industry, organizations are always going to look at time to market as a barometer for success – after all, bringing time to market forward can reduce out of pocket expenses by up to $6 million – so when R&D managers report that one third of their projects are currently behind schedule, everyone really ought to take notice. Over the next few pages, we examine what challenges contribute to delays in the collaborative R&D process, and explore how they often combine to compound the issues. When working with different teams, departments and organizations, how you communicate can be just as important as the actual work being undertaken. 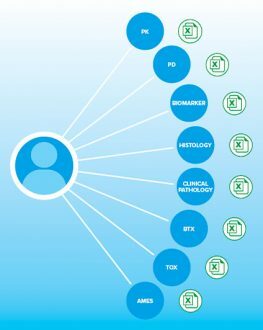 With over 80% of pharmaceutical organizations increasing their outsourcing research to CROs and academic partners within the last five years, modern R&D environments are no longer confined to just one department or company – and that means projects need to be managed differently. Giving work to teams and keeping up with progress – both internal and external – can be very hard, especially when working from different locations and using different systems. How do you contact them? What type of communication do they expect? Are they even using the right project code or name? Things can get very confusing, very quickly. It’s important that teams are all ‘singing from the same hymn sheet’ – but the modern R&D landscape has made it more difficult than ever. We know that collaboration projects can cause all kinds of logistical problems – with various stakeholders needing to coordinate activities and transfer progress updates, data, and reports. Not to mention keeping everything safe and secure. In an ideal world, results should be easily searchable, dated and timestamped, and other contextual information digitally recorded, meaning colleagues trying to repeat experiments have as much information as possible to avoid repeating mistakes. Too often though, these issues aren’t fully addressed, and occasionally, they are ignored altogether. In every collaborative R&D environment, a project manager needs the ability to assign tasks to individuals and teams, and track the status of that work. Knowing who is doing what, and when they are doing it, should be one of the easiest processes to oversee (it sounds so simple when you write it down) – but things are rarely that easy in practice. The communication and technology issues we’ve already outlined contribute to the problem, meaning you might need complex, custom integrations between ELNs, LES, LIMS, and any other tools your collaborative partners are using, to even start to paint an accurate picture on what work is, and isn’t, being completed. Worse still, you could be left using email to manage complicated multi-step procedures and experiments, with teams across the globe. Many R&D organizations are still using legacy on-premise software for their collaborative projects. On-premise solutions can be expensive and difficult to upgrade, and frequently, R&D they often hold back on new implementations for years. This means organizations are unable to take advantage of technology enhancements that would support faster, leaner innovation. Technology is a particularly important consideration for collaborative R&D work. If you are working with an external team, it’s unlikely your IT teams will allow those third parties access to your network easily – so your systems, originally brought in to save time and speed up processes, do the opposite. The rigidity of on-premise solutions means they’re not integrated into the collaborative process and ensures someone will have the unenviable task of copying and pasting data out of various tools and spreadsheets into others. This process wastes time, and also risks corrupting data with human errors. In the lab, data is at the heart of what you do. Every test, experiment or study relies on the quality and integrity of the data recorded – so it’s one area laboratories should be investing their attention, time, and money. With organizations creating more data than ever before – it’s estimated that humanity will produce 33 zettabytes of data this year alone (only nine zettabytes lower than all human languages ever spoken) – it’s clear we need to take better care of how we look after our data, and ensure the integrity of the data we are creating. But, to do that, organizations need to be prepared to invest in forward-looking solutions that can cope with the demands of collaborative R&D work. More than 70% of researchers have tried and failed to reproduce another scientist’s experiment. Even more worryingly, more than half of scientists have failed to reproduce their own experiments. Capturing data consistently, and in a way that is reproducible, is becoming ever harder across a diverse and growing set of partners – and the reproducibility crisis is hitting collaborative R&D every day. The results of in-house experiments will often form the basis of multiple follow-up experiments (often conducted by external partners and collaborators, like CROs). In some cases, one experiment will form part of a group of 15 or 20 separate projects that combine to become one set of results. In this situation, there could potentially be hundreds of different people all working simultaneously with the same information – so one wrong number at the start of a collaborative project could be very, very costly. The answer could be really simple. You need the right tool for the job. Deciding how to address all the requirements of your R&D lab, your scientists, and your experiments need to fulfil is no small matter. After we are talking about 100s of hours gained back, potentially 1000s of mistakes avoided and up to $6 million saved, just by using a system that meets your needs and is designed to make things easier – not harder. Ensures all relevant information (notes, web links and documentations) can be associated to single samples, single service teams or a whole body of work – so the right information goes to the right people at the right time!